As much as Americans enjoy their sandwiches at lunchtime, sometimes you’re ready for something different. 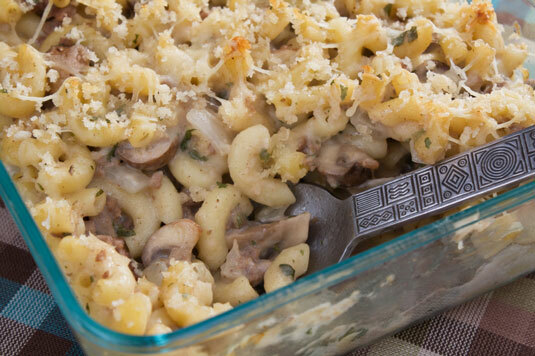 This gluten-free casserole recipe can lend variety to your nourishment fare and leave your tummy feeling full and content. Preheat the oven to 325 degrees F. Spray a 9-x-13-inch baking dish with cooking spray. In a large skillet, brown the sausage and onion over medium-high heat, breaking up the meat with a fork. Remove the skillet from the heat and drain off the fat. Boil the pasta in water in a large saucepan until it’s barely tender and then drain. Return the pasta to the saucepan and immediately stir in the cheese so it melts. Stir in the sausage, soup, and pepper. In a small bowl, stir together the bread crumbs and melted butter. Sprinkle this over the macaroni and sausage. Bake the casserole for 30 minutes until hot and bubbly and the bread crumbs start to brown a little. Per serving: Calories: 333; Total fat: 17g; Saturated fat: 9g; Cholesterol: 51mg; Sodium: 1,233mg; Carbohydrates: 31g; Fiber: 1g; Sugar: 4g; Protein: 15g.